Anyone ever notice I’m a list-maker? There are a lot of reasons I love lists, which I plan on sharing with you soon. But today, because I’m turning over a new leaf, I’ll share with you this: the first installment in my new and recurring “Top 10 Lists”. Top 10 things to do at 5:30 am. 1) Clank around the french press/coffee mugs/refrigerator, wake up the dog, and then blindly ignore his pleas to be let outside. Your excuse will later be that it was dark and you didn’t see him there, but as you’re cleaning pee stains off of the chic and over-rated “unfinished” wood floor, some part of you will be making a mental note to be a better pet parent tomorrow. My husband just came out of the kitchen and announced his great idea for my next blog. I’m so fired up I can’t even wait until tomorrow – yep people, two posts in one day, watch out. Brace yourself now, it’s riveting: “My Wife Has Too Much Faith in the Dishwasher”. Can I get a WTF here, please? It’s a dishwasher, an appliance whose sole purpose is to clean the friggin’ dirty dishes, yo! 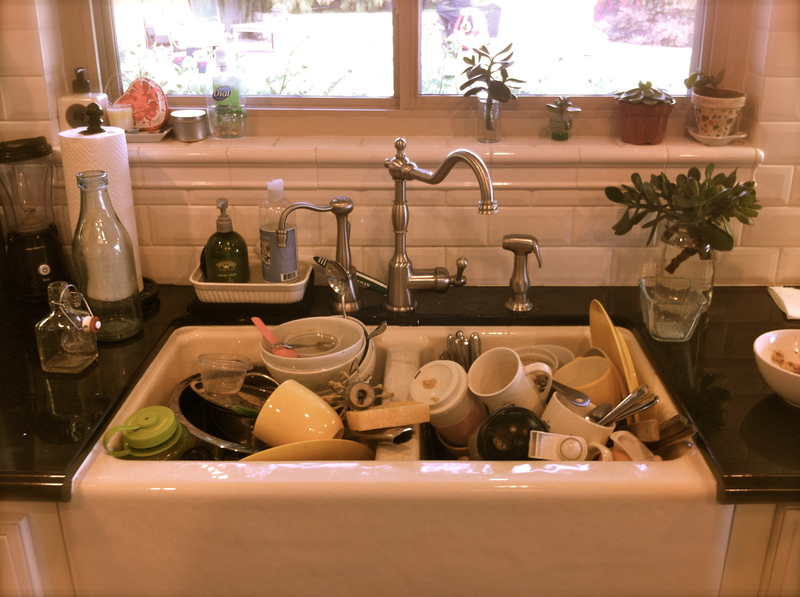 There is no middle ground here, no need for scrubbing the sink full of dishes in preparation for the godforsaken wash cycle. It either works or it doesn’t. And if it doesn’t then it’s time for mama to go shopping. But according to my husband, the dishwasher’s job is to sanitize. He has forgiven its weakness and lovingly re-conceptualized the very definition of the dishwasher to allow for it’s inefficiency. Sounds like marriage. Not mine, of course. Or parenting. But not mine, obviously. Normally I have no basis for complaining because I am not the designated dishwasher in the house, I’m the cook. I cook, someone else cleans. I feed you, you keep the house from looking like an episode of Hoarders. Fair deal. Normally I’d be laughing, not ranting. But I have a fever. I’m dazed and confused. Which is also why I feel the need to apologize to anyone else in the movie theater last night who heard my husband blurt out the word “nerdgasm” halfway through the Avengers preview. Yes, he was serious. Seriously as excited as any nerd has ever been. And although this is unrelated to the rest of my post, it seems like the appropriate arena to mention it. I say it with love. And with thanks that I’m not the one doing the dishes.